I originally posted this a few days ago however I couldn't get the pictures to work. I have now re uploaded this time with the pictures for your perusal. 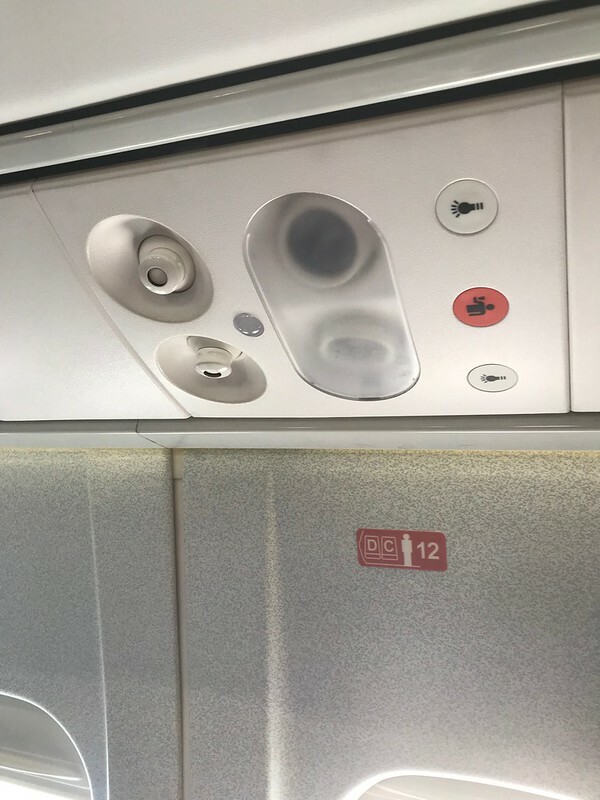 I have been a long time viewer of forums on airliners.net and have always wanted to post a trip report or in some way make a contribution to this forum. 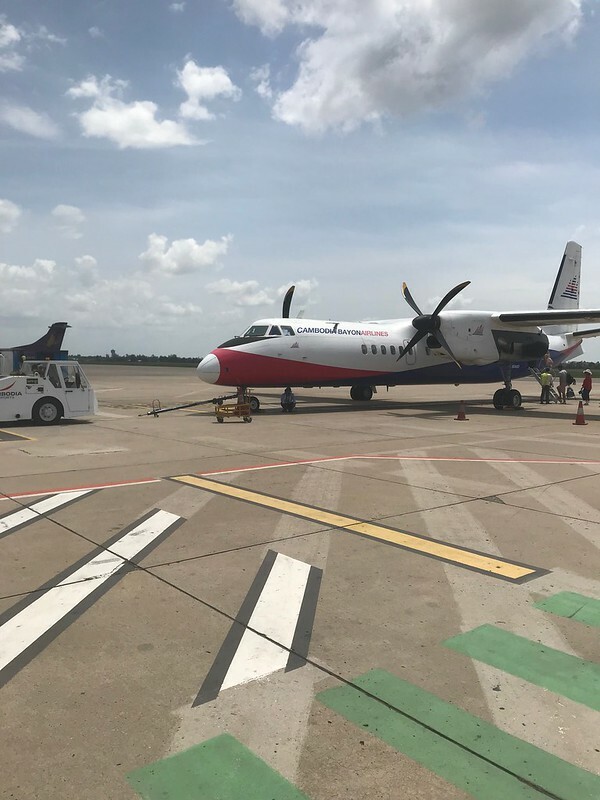 Finally I have done it with a story for you all about a domestic trip in Cambodia on a little known airline, Cambodia Bayon Airlines, on a relatively uncommon plane in the skies, the turboprop Xian MA60. A video presentation of this flight can be found on this link to my YouTube channel: Feel free to like and subscribe. So how did we come to flying on this relatively unknown aircraft and airline? Well, quite simply, it’s what came up on a Google search for ways to get from Siem Reap to the islands off the west coast of Cambodia. My wife informed me that the best place to get to the islands was from Sihanoukville, a port town and get a ferry from there. 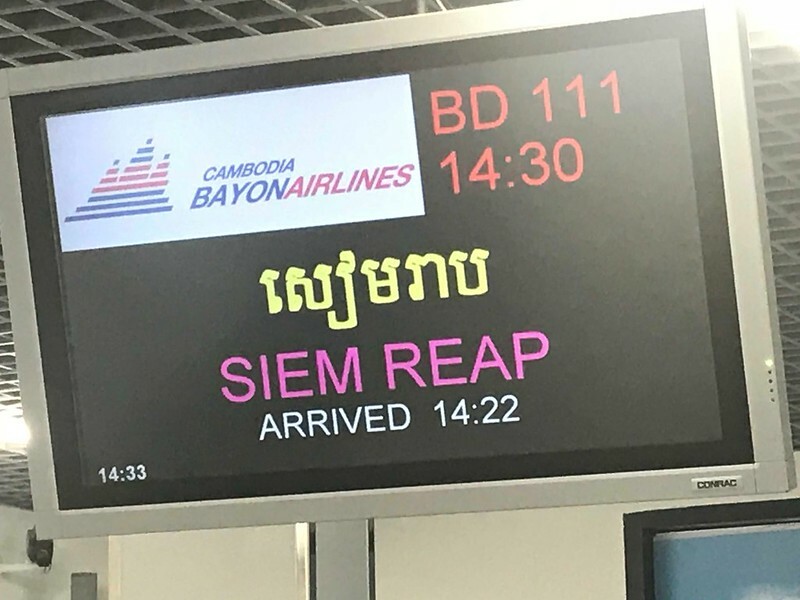 She let me know about this airline she had found called Cambodia Bayon Airlines and I proceeded to check out their website. 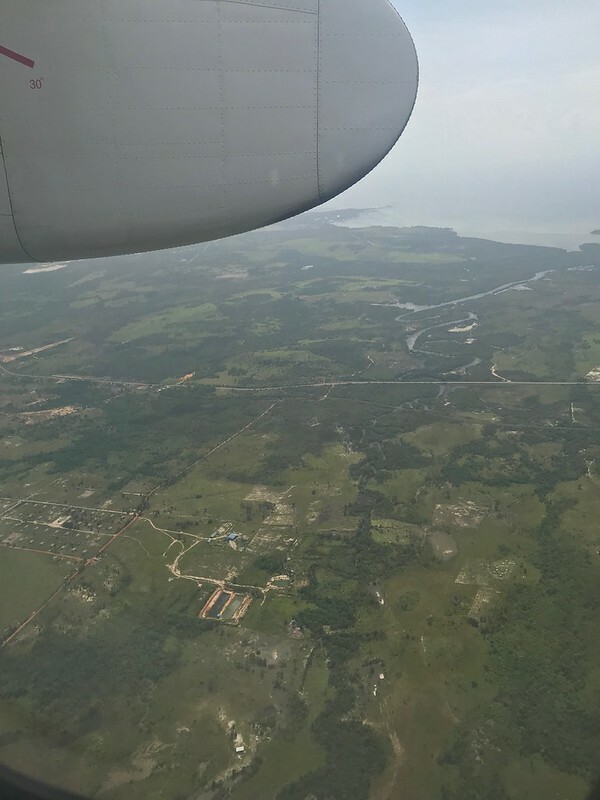 Sure enough, they had what we were looking for, a flight from Siem Reap to Sihanoukville. Off on the website to book with the cost being a respectable US$62 per person for the one-way flight including 20 kg of baggage! Interestingly their main form of payment was trough PayPal so the following day I contacted the airline to ensure payment had been received and we were indeed confirmed for the flight. Travel day came along but first thing in the morning we visited the historic temples of Angkor Wat near Siem Reap which took up most of our morning. Fortunately, being a domestic flight, the check-in time was 30 minutes before departure. 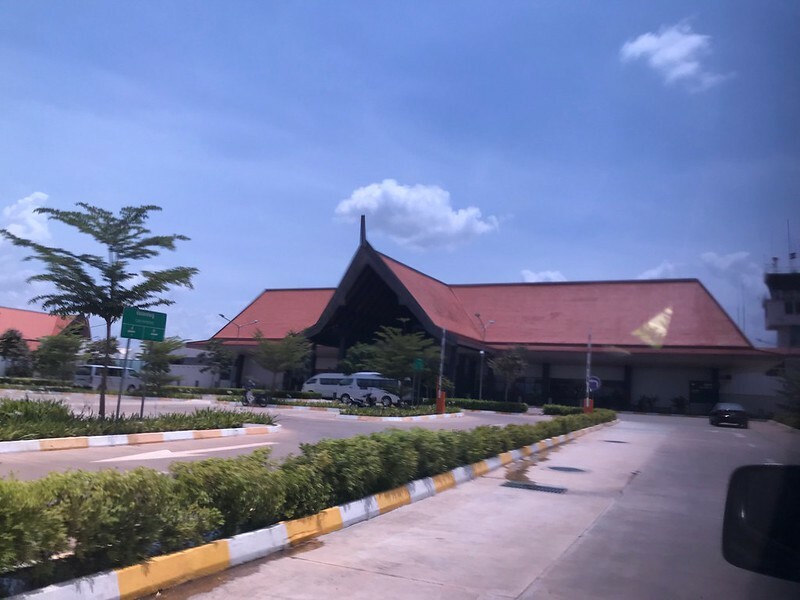 Considering we spent a lot of time at Angkor Wat in the morning, this was fortuitous and after a few tense moments of watch checking, we arrived at the domestic terminal of Siem Reap Airport about 40 minutes before departure. 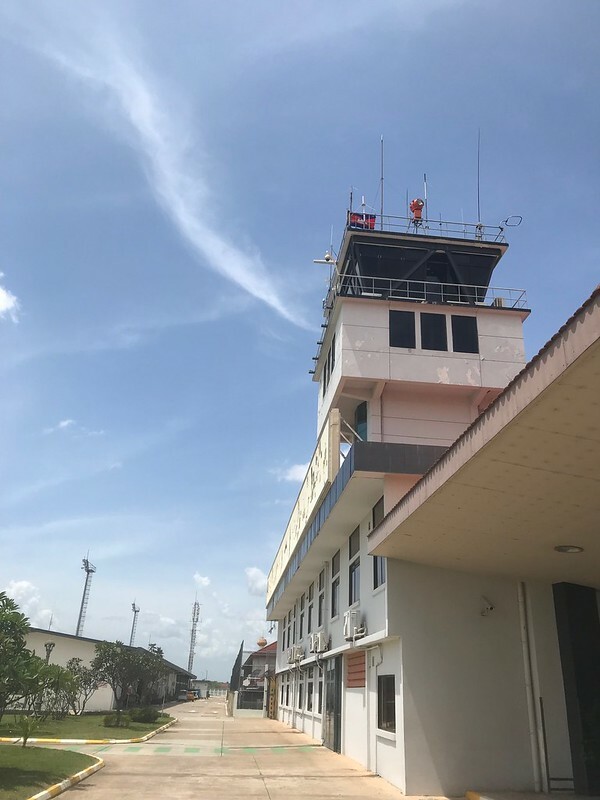 The domestic terminal is a small stand-alone building but shares a common ramp with the larger international terminal which caters for most of the flights into and out of Siem Reap. Check-in was quick with very few passengers in the terminal at the time and security was swiftly passed through. 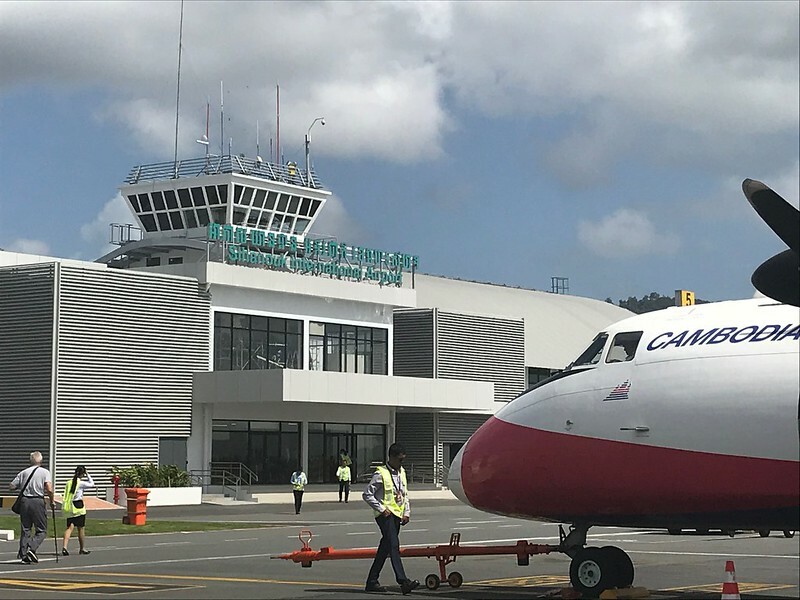 The main waiting area inside the terminal has a small cafe and gift shop along with a small number of boarding gates, all ones that involve walking to the aircraft. We took the chance to have some lunch at the small cafe there with a reasonably priced ham and cheese croissant and a latte (well needed after a 4am start that morning!). 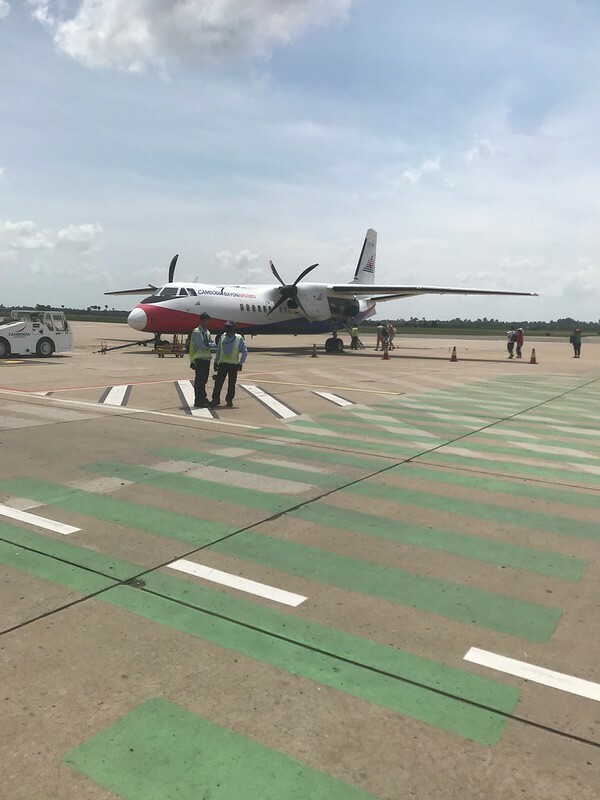 Boarding was called for the flight and very quickly we were walking out on the ramp to our MA60 that would take us to Sihanoukville that afternoon. As my father said to me later on, it looked like a Fokker Friendship clone but it certainly was an impressive sight seeing it there. Boarding was through the rear stairs and for me being a tall man, a squeeze through the door and we were welcomed by the two flight attendants for this trip. 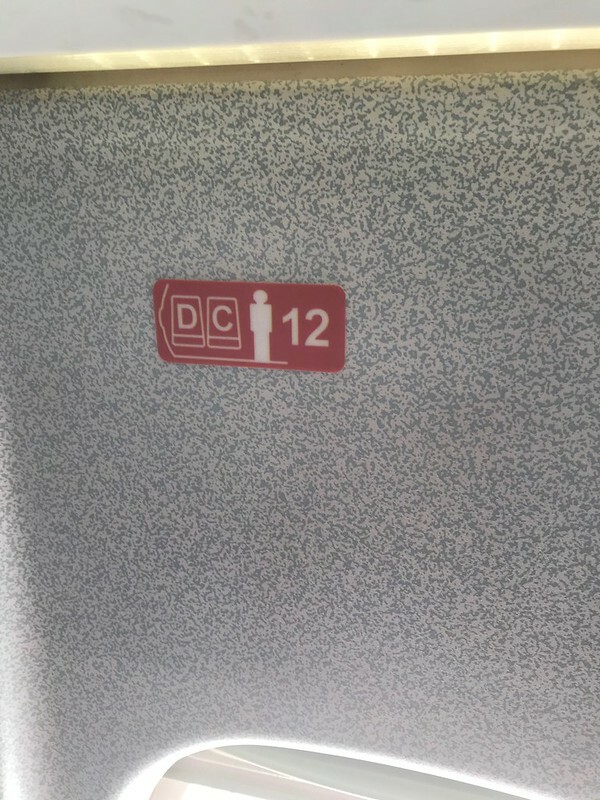 We took our seats, 12C and 12D, which was the last row of economy on the 2-2 configuration. But interestingly we weren't at the very back of the cabin. 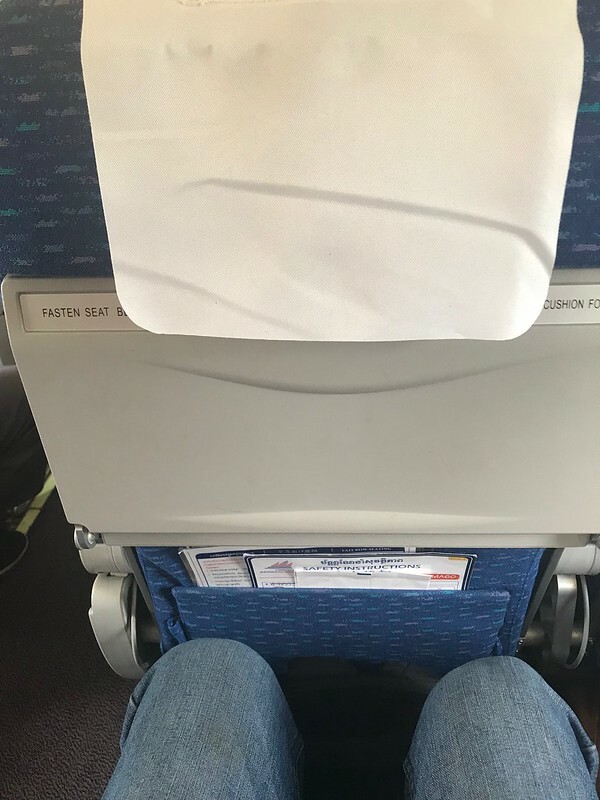 There were actually two business class seats behind us in a 1-1 configuration, partially seen in the picture below, with one of these seats being occupied. 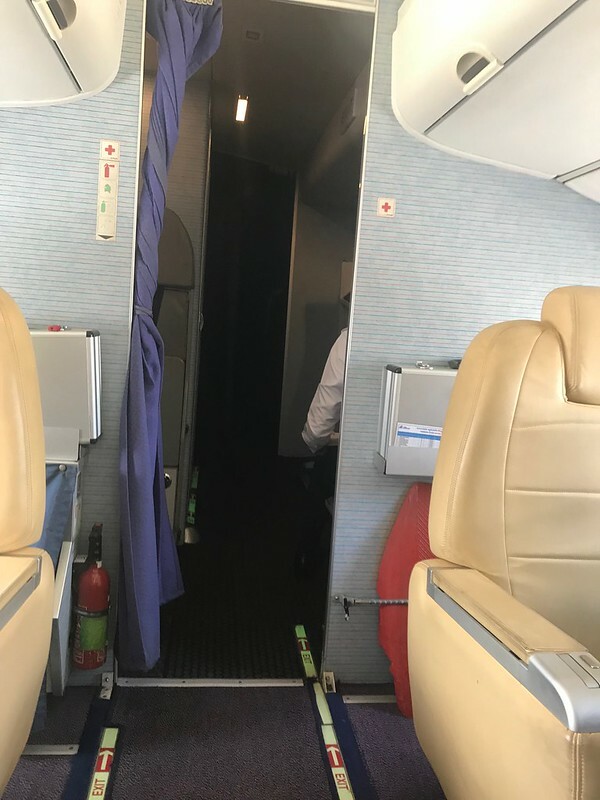 I imagine the reason for this would be to keep these passengers in a quieter part of the aircraft and not next to the noisy propellers. 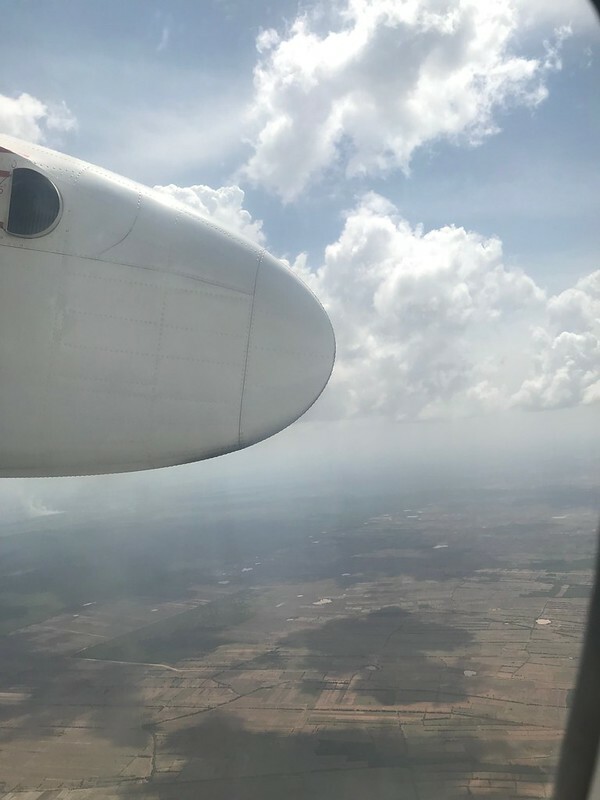 It was a quick climb-out from Siem Reap over the nearby countryside and lakes which provided spectacular views of the scenery. 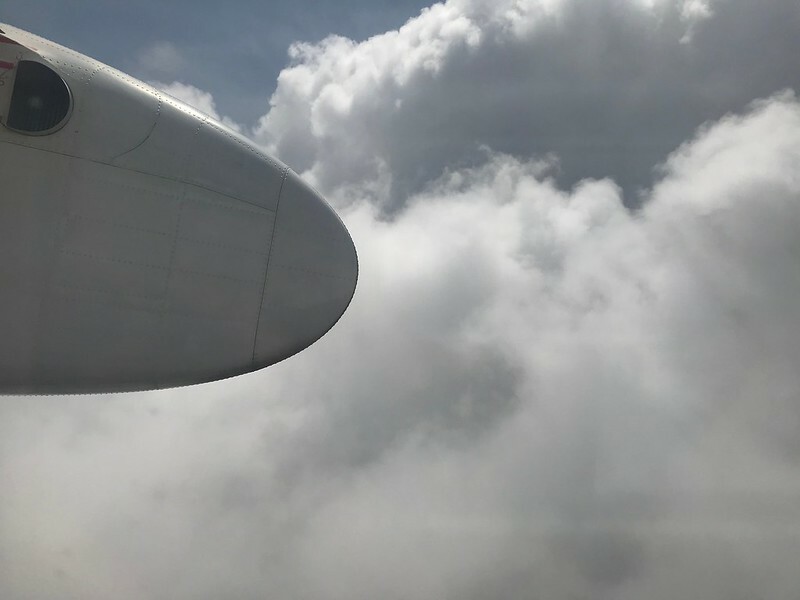 Soon enough we were at our cruising altitude for the flight in which both my wife and I fell asleep due to sheer exhaustion of our early start that day. 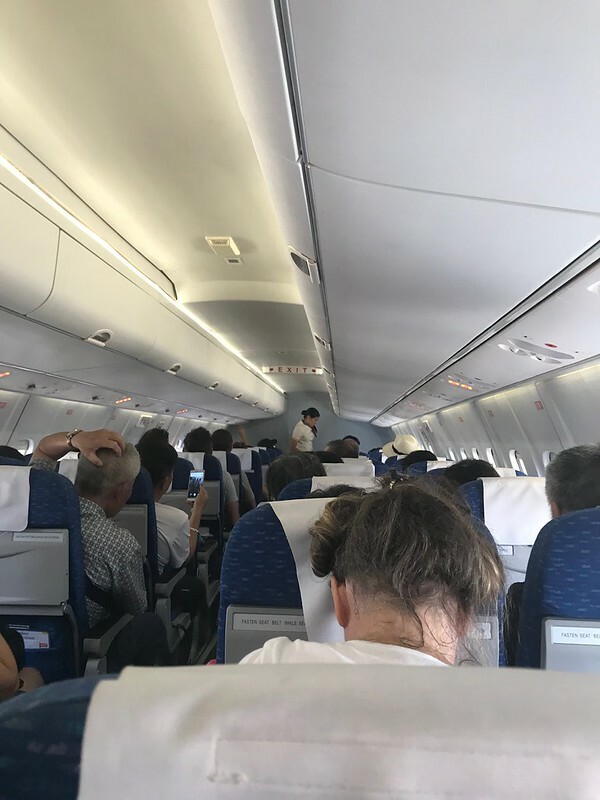 Although I wasn’t able to observe, it did seem that the flight attendants had offered tea, coffee and water throughout the short flight. 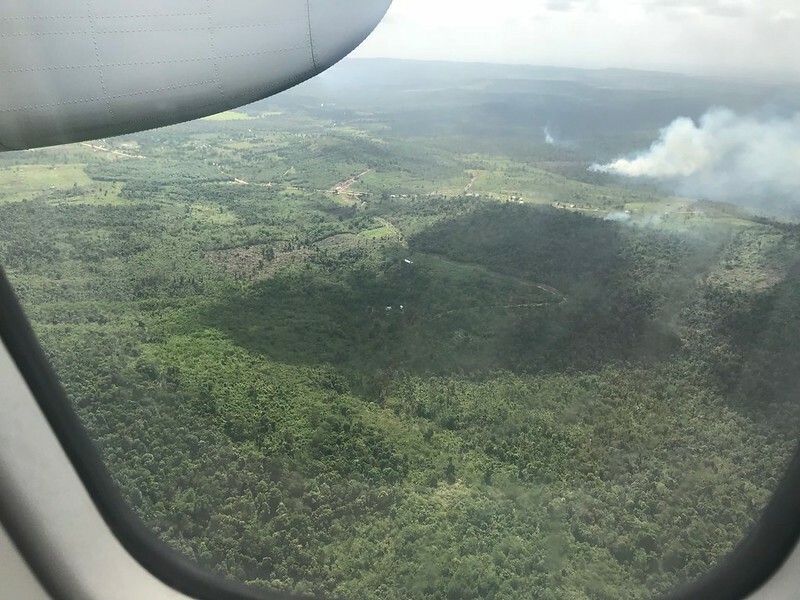 We awoke to the descent into Sihanoukville, once again greeted by the wonderful green scenery of forests and farm land below. The descent and approach was fairly smooth with the odd bump here and there. 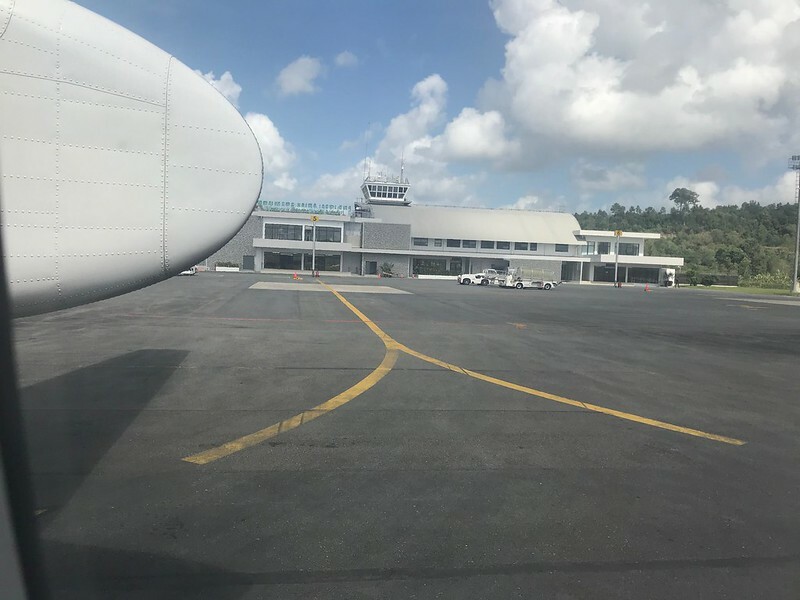 We landed smoothly on the runway and after a quick deceleration we were on the taxiway and headed towards the terminal for de-boarding. The descent, landing and taxi can be seen in this video link. Disembarking from the aircraft was via the stairs and a short walk to the terminal to the baggage claim area. 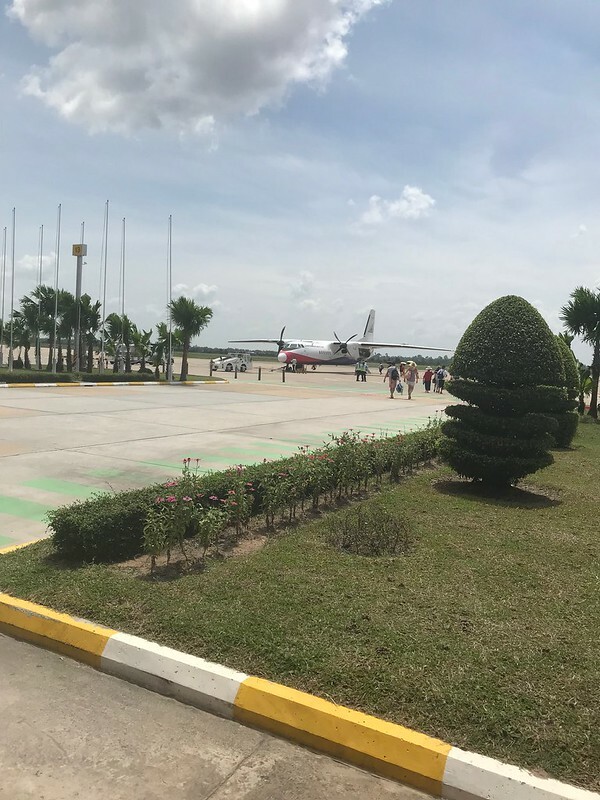 There was just a short wait for our baggage and we were on our way outside the terminal to arrange a taxi to the town and off to enjoy our time on the wonderful islands of the coast of Cambodia. My overall thoughts on the flight, aircraft and airline are generally positive. The aircraft was clean and quite modern looking inside. The airline gave good, friendly service and we had no problems with check-in, the whole flight or getting our bags afterwards. 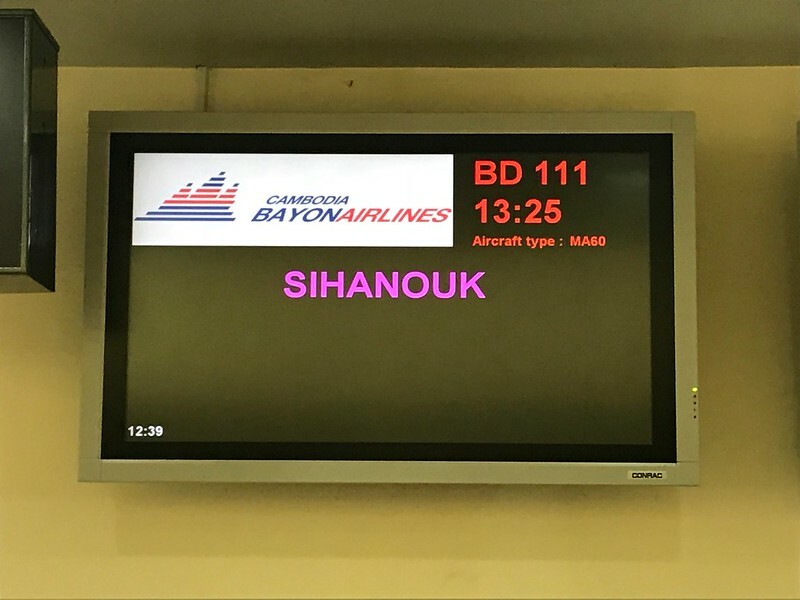 I would recommend this airline if you’re travelling internally within Cambodia as they provide good service at good value for money. Thank you for posting with photos! Interesting, BD flight numbers used to be British Midland in UK. Flight aware shows last BD111 flight as LHR-AMS in 1999! Nice report. 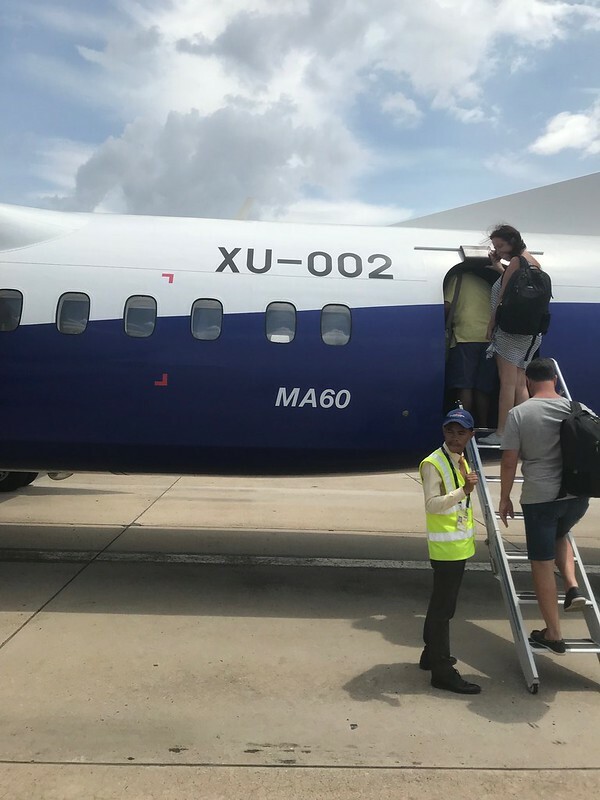 The MA60 is quite a rare bird outside of China and Africa. I flew one in Philippines some years ago before they got rid of them. Very cool TR, always great to read from such exotic airlines and places... Well done!!! Thank you all for reading my first trip report. I’m glad you all enjoyed reading about this trip on a rare aircraft and airline. Never occurred to me that the flight code was from British Midlands. I’m not sure if anyone would be flying an MA60 LHR-AMS! I’d never really heard of the MA60 prior to this trip. My father jokingly said it looked like an F-27 clone! Certainly a lot of similarities. I don’t know about being brave but the aircraft does have an interesting history from my research about it prior to the flight. Good thing was that we arrived at KHS in one piece! 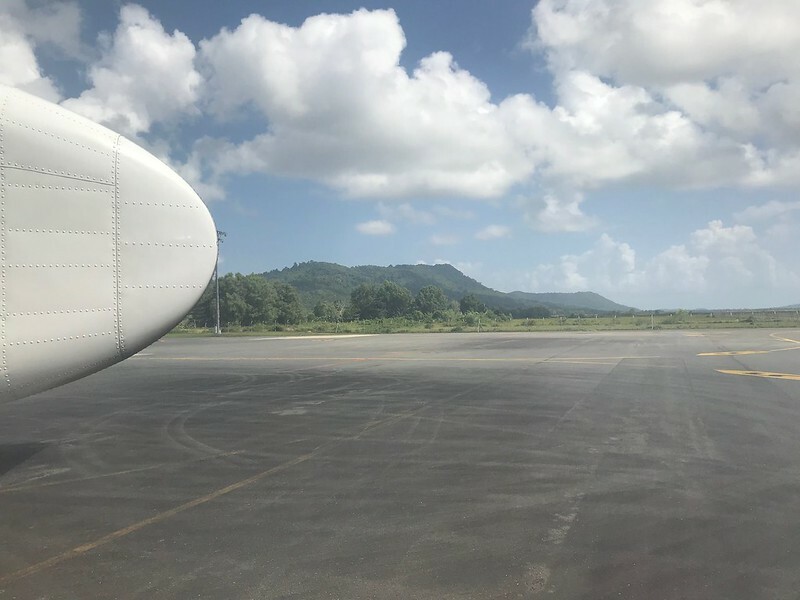 I have some other trip reports to write from this journey but I certainly wanted this to be the first one in the series due to the rareness of the aircraft and the unique airline and places. Glad you enjoyed! This may sound a bit delusional, but the MA60 is an aircraft I'd actually like to fly on simply because it's rare. Personal thoughts aside, nice report, and I hope you write more about your travels. Certainly could be an AN-26 clone too! It was good to travel on a rare bird. Despite what I read about it beforehand, it still was a once in a lifetime experience, I doubt I would have the chance to travel on in the future. Thanks for your kind words about my first report and I’m looking forward to uploading another report soon! Did you know it would be a MA60 when you booked or was it a surprise? I had to do some research first about the airline because I had never heard of them. So I had already found out that they operate the MA60s prior to booking.